You can see 3 “Cigar” Style pens in progress, and one finished. 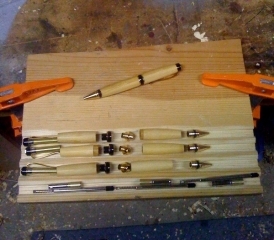 They are all in bamboo as will about half this order of 16 pens. With large orders I like to kind of “assembly line” the production of them which saves time and effort since I can cut all the same size at once, drill all at once, etc. Then I can take my time on the turning which is the fun part anyway.